(Newser) – Days before he carried out the deadliest mass shooting in modern American history, Stephen Paddock's odd behavior disturbed a housekeeper at the Mandalay Bay hotel. 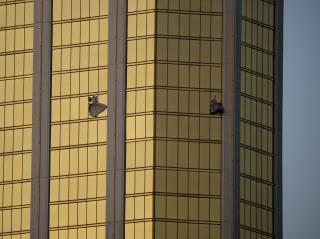 The housekeeper, whose account was among 1,200 pages of witness statements released by Las Vegas police Wednesday, says that when she cleaned his suite four days before the Oct. 1 massacre, he stayed in the room and stared at her while she worked, the Las Vegas Review-Journal reports. She says Paddock was working on his laptop and eating soup from room service while she was in the room, and she never saw his screen. "He keep on staring at me," says the housekeeper, who found it odd that he had more then five pieces of luggage in the room. Paddock killed 58 people when he opened fire on concertgoers from the suite. Keep squeezing that teat, newspeople. I'm sure there's another drop in there. Its interesting in how they replaced the windows with exact copies. I figure that they had some spares on hand because if you visit today, you don't see any evidence of the incident from outside of the building. It will be interesting to see the airing of American Ninja Warrior which has usually filmed across the street in the same spot as the ill fated festival. I was wondering if they were going to switch it to MGM's northern festival property across from the SJS or old Sahara. The producers have a few options for background setups and it includes Wynn's, Encore, Circus/Circus, and Trump's Tower. Now it would be a triumph for women if they showed Trump's tower because it was the first tower of its size to be built by a woman contractor. But there's drama in that because she has since gone to the dark side. 9 months later we're back to hating on Muslims and Mexicans. Forgot all about the biggest terrorist strike in the US this decade, and the biggest terrorist group in the USA: the NRA.